Learn more about what an EnPak A30 can do for you. Get detailed specifications on the EnPak A30 gas unit. Discover how EnPak systems deliver real benefits to people like you. Get detailed specifications on the EnPak A30 diesel unit. Compared to a work truck with a PTO-driven air compressor and an engine-driven welder/generator on board, an EnPak A30 can reduce weight and meet work crew needs for compressed air, electrical power and welding capabilities — all while the work truck’s engine is turned off, reducing fuel costs and truck maintenance. A work truck with an engine-driven welder/generator on board and an engine-driven air compressor in its payload area has less room for other important tools. An all-in-one EnPak A30 can increase available payload so work crews can bring everything they need to the jobsite. If a work truck has an all-in-one machine with reliability issues, output limitations or it just doesn’t look professional, replacing it with an EnPak A30 can deliver reliability, performance and a premium appearance. If a work truck only carries an air compressor, work crews may not have all the capabilities they need. The EnPak A30 supplies compressed air, generates AC/DC power and has multiprocess capabilities. 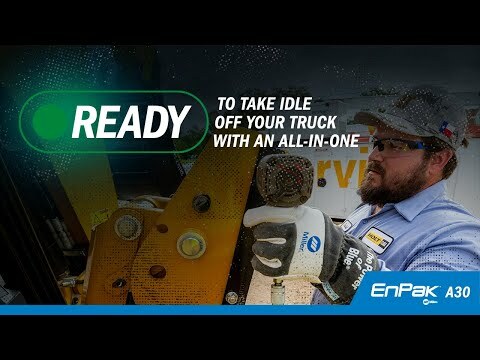 Installing an EnPak A30 means operators can shut their truck engines off, eliminating unnecessary idling while still allowing them to power their jobsite tools. Delivering 30 cfm of air, virtually any air tool can be efficiently powered by the EnPak A30’s rotary-screw compressor. The EnPak A30 provides up to 100 amps of DC power for 12/24V battery charging and up to 300 amps for crank assist. With its 6,500-watt generator, the EnPak A30 powers 120/240V AC needs. The EnPak A30 can easily handle metal repairs with its 210-amp inverter-based welder that’s capable of stick, MIG and DC TIG welding. EnPak A30 delivers big capabilities in a small footprint. The gas unit is 47 in long, 20 in wide and 25 in tall. The diesel unit is 47 in long, 20 in wide and 28 in tall. Allows the EnPak A30 to connect to a telematics system so you can monitor engine data, machine loads and usage. Track service intervals, schedule maintenance proactively and improve diagnostics of your EnPak power system. The EnPak A30 gives fleet managers the option to standardize fuel type or integrate into the chassis fuel tank — eliminating the need to fill two tanks. Integrated into the truck battery system, Chassis Power monitors the battery and automatically charges it as needed. Technicians can turn off their truck without worrying about draining the battery — leaving them stranded. Advanced Auto-Speed technology automatically adjusts engine speed to match compressed air, battery charge and weld demands — reducing fuel consumption, maintenance costs and noise for a safer, more efficient jobsite. Automatically turns the EnPak engine on and off based on demand, reducing fuel consumption and noise — which enhances safety and improves the work environment. Highly efficient without sacrificing power, the EnPak A30’s engine uses far less fuel than the work truck’s engine, delivering savings on fuel costs that quickly add up. Turning off a work truck and turning on the EnPak A30 can reduce the truck’s engine idle time by up to 75 percent. With advanced Auto-Speed™ technology and Auto Start/Stop, the engine runs at the appropriate speed when needed to meet demands — saving fuel and reducing operating and maintenance costs. Compared to a work truck with a PTO-driven air compressor and an engine-driven welder/generator, the EnPak A30 cuts weight and increases available payload — so trucks can carry the equipment needed to get jobs done. Compared to other all-in-one work truck products, the design and engineering of the EnPak A30 is superior. It’s ruggedly built and rigorously tested to deliver the exceptional reliability and performance you expect from an industry leader. One main control panel with simple, straightforward controls and a weld/battery output panel is included with the EnPak A30. An optional auxiliary power panel is also available. These panels save time and reduce the risk of injury by eliminating the need to climb into the truck bed to make adjustments on the machine. The EnPak A30’s interior components are concealed within a durable, precision-engineered enclosure, so work trucks present a professional image.